The rug doesn't fly but it definitely has magic. It has never moved, and yet this humble, handwoven rug was my direct path to the world of fiber arts. It might as well have wrapped me in hand spun, vegetable-dyed wool threads for the ride of a lifetime. The rug was a catalyst. It sparked interest in new ideas and opened new paths into the many-faceted fields of fiber and textiles. It has been a wondrous journey and one I could never have imagined. The rug became part of our lives many years ago on a trip to the Southwest. We fell in love with the Native American art of the region. We admired the pottery of Maria Martinez, the potter of the San Ildefonso Pueblo, we loved the beautiful silver and turquoise jewelry, and the Navajo rugs. Oh, the rugs! Each was more beautiful that the next. And the more we learned about them, the more we wanted one. We particularly liked the Two Grey Hill rugs, which feature geometric patterns woven from the natural tan, brown, gray, black and white colors of sheep fleeces, but as young-marrieds, the prices were well beyond our budget. We compromised. At Hubbell's Trading Post, which is now a National Historic Site in the Southwest's Four Corners Region, we found a Navajo rug that we liked and could afford Handwoven of hand-spun wool in natural and plant-based colors, the design of the rug is a traditional pattern. The rug appears to have a weaver's pathway. 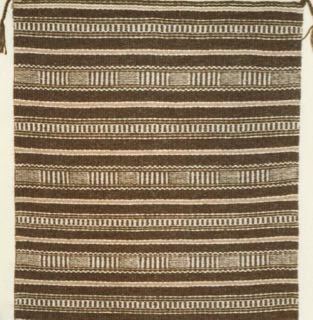 Also known as a spirit trail or spirit-line (in Navajo, ch’ihónít’i), these lines are composed of a single weft shot or a few rows found near the end of the weaving. They are symbolic and attributed to the release of the weaver's spirit from the woven item. You can see the section in the close-up of the top left of the rug, where there is a distinctly darker and different-colored horizontal section that moves from well inside the tan section to the outside left edge of the rug in the photo above. It isn't consistent with any part of the pattern or even with the color in any other part of the rug. And it is not consistent with a typical edge-to-edge weft weaving process. It would have required more work to weave in the small section. On returning home from our trip, I read everything I could find about Navajo rugs and weaving. But I could never have imagined where the rug would take me! Dyeing quickly followed. I used dyestuffs that were readily available--onion skins, marigolds, walnut hulls, etc. Lots of yellows, tans, and dull greenish colors. I am still drawn to handcrafted textiles. And especially those by local craftsmen and women. Be it in the Southwest, Scotland, Ecuador, China, or in my village, I am not only inspired by, but love to use, wear, admire and live surrounded by examples of their work. And it all started with the rug. I recently came across a photo of a rug that I exhibited a number of years ago and was reminded of the influence of Navajo rug patterns on my weaving. OH! I love this. What a great reflection on how it all started. Love hearing your story. 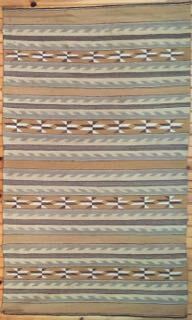 Two Grey Hills are my favorite Native rugs as well. Your woven rug is gorgeous! So good to hear from you, Nina! I suppose it's little wonder that fiber people like us are drawn to Two Grey Hills rugs with their natural wool colors and beautiful patterns.